You can choose your preferred sport from the range we have to offer. 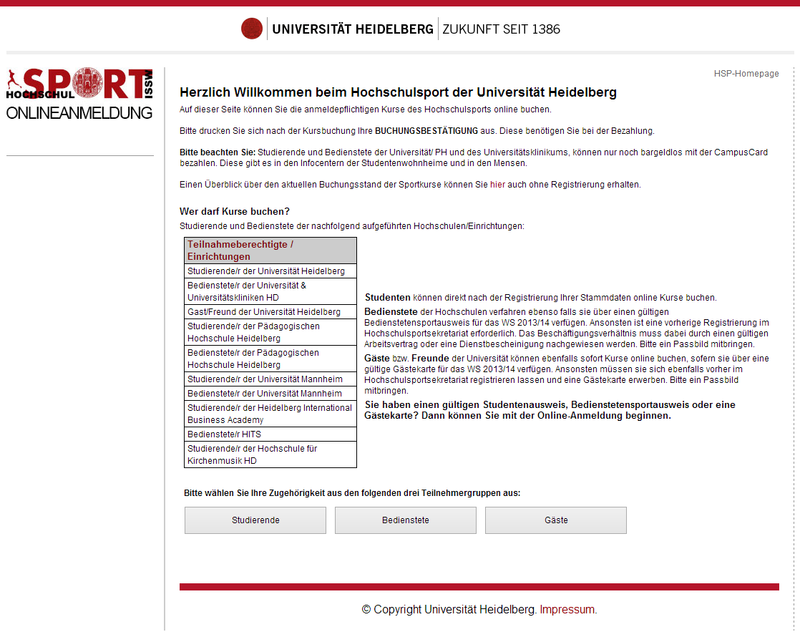 Just click on the button “Kursanmeldung” and choose a category. In the schedule you will find information about the price and booking status. For more detailed information click on the coloured button in the right column. You can see all the information you need to know. If you want to participate in the course you have to click the button below “Diesen Kurs verbindlich buchen”. Print the booking confirmation and pay your booked course within two workdays at the Unisport office at INF 700. Please note that you can only pay with your Student-ID or the campus card of the Studentenwerk Heidelberg. Make sure you have enough money on your card. To take part in Unisport you need a sports card. You can get it at the Hochschulsport office, INF 700. Therefore you need to bring a portrait photo, your contract of employment and a charged campus card (5€) of the Studentenwerk Heidelberg (there is no possibility to pay cash). With this sports card you can take part in all free sports courses. In the schedule you will find information about the costs and booking status. For more detailed information click on the coloured button in the right column. You can see all the information you need to know. If you want to participate in this course you have to click the button below “Diesen Kurs verbindlich buchen”. Print the booking confirmation and pay your booked course within two workdays at the Unisport office at INF 700. Please note that you can only pay with the campuscard of the Studentenwerk Heidelberg. To take part in Unisport you need a guest sports card. You can get it at the Hochschulsport office, INF 700. You need to bring a portrait photo and your Identity card. You can pay (120€) with the campus card of the Studentenwerk Heidelberg or an EC-Card. We cannot accept cash. Print the booking confirmation and pay your booked course within two workdays at the Unisport office at INF 700. Please note that you can only pay with the campus card of the Studentenwerk Heidelberg or an EC-Card.